In 2013, Entertainment Weekly ran a special issue featuring multiple cast reunion photo spreads from some of our favourite TV shows and movies. 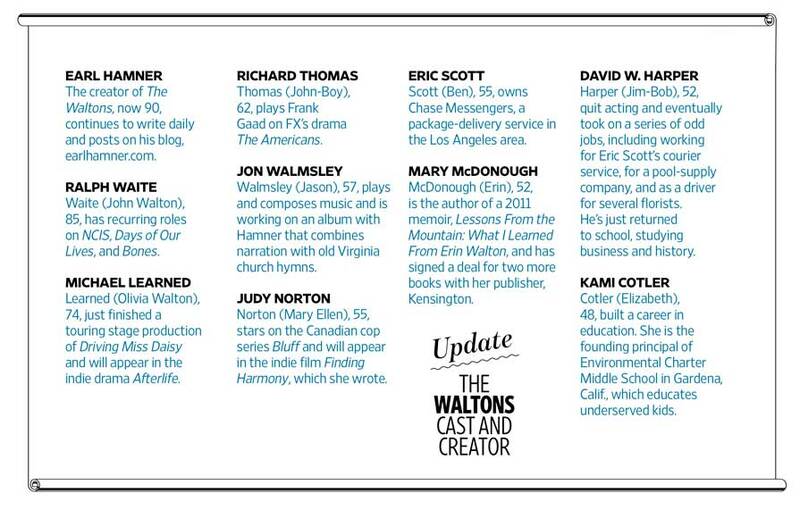 The surviving cast members of the Waltons including it's creator Earl Hamner were among the casts featured. Click here to watch a 60 second behind-the-scenes video clip filmed during the photo shoot. Subversive" is not the first word (or the 10th) that springs to mind when someone mentions The Waltons. The 1970s series, about a rural Virginia family struggling through Great Depression, ran for nine seasons on CBS, earned 13 Emmys, and at its peak was watched by an estimated 18 million people weekly. But the rap on the show has always been that it was "sweet" or "sentimental" So what's shocking about rewatchlng it now, more than 30 years after its finale, is how wrong-or, at best, reductive-that is, "People think it was a sugary show," says Michael learned (matriarch Olivia Walton), 74, "But it was groundbreaking in many ways". When The Waltons debuted in September 1972, the divorce rate in America was already above 30 percent, on it's way to 50. The Watergate break-in had happened in June. The Vietnam War continued to rage, and the top shows on television were All in the Family, Flip Wilson's variety show, and Marcus Welby, M.D. The climate hardly seemed right for a family drama set in the 1930s. CBS commissioned a series anyway, motivated by the success of a TV movie about the Waltons The Homecoming: A Christmas Story and then began recasting a few roles. "I wasn't interested;' says Ralph Waite, 85, who played John Walton. "But my agent talked me into it. He said, 'It's so soft, it's never going to sell, but you could get a little money so why don't we do it?" It looked soft, to be sure. Based on Earl Hamner's best-selling novelized memoir Spencer's Mountain, which had already been adapted into a 1963 film starring Henry Fonda and Maureen O'Hara, The Waltons was essentially a nostalgic coming-of-age story. John-Boy (Richard Thomas), the eldest son of seven children, dreams of being a New York City writer but times are hard and his family needs him. Living on a farm in the Blue Ridge Mountains with his parents, his siblings, his hard-shelled grandmother (Ellen Corby), and his salty grandfather (Will Geer), John-Boy longs to leave home but can't bear the thought of it, and is so gentle-hearted that he can't even shoot a turkey for the family dinner. Soft? You bet. But it was also radical in the age of Gunsmoke and Adam 12. "John-Boy was a new kind of male protagonist on television" Thomas says. "That kind of sensitive, feeling man was about as different as a central male character could be on an hour-long series." The show tanked at first, but word of mouth spread, aided by a publicity campaign with the tagline "This program is too beautiful to die" By the end of its first season, it had climbed into the top 20. By its second, The Waltons was the No. 1 drama, and the bedtime call-and-response that ended each episode -"Good night, Mama," "Good night, Mary Ellen," "Good night, John-Boy"- had cemented itself in, the national vernacular. In retrospect, it's easy to understand why the show broke through. The country was in a state of upheaval that would continue for years, and The Waltons provided Americans with an escape hatch to a simpler time, a comforting reminder of the principles that had helped build America in the first place. Its the kind of show that was - and still is - lauded by conservatives (and just plain folks) as an example of "traditional family values." But simmering beneath that sepia-toned sentiment was a quiet, unabashed liberalism, "The Waltons," says Mary McDonough, who played middle daughter Erin, "were New Deal Democrats " In just the first season, the show addressed - and took a stand against - sexism, anti-Semitism, religious fanaticism, book burning, xenophobia, and intolerance. "What people who [criticized] the show for being too goody-goody wouldn't realize is that these episodes were conflict-driven," Thomas says. "We tried to take historical events and brush them up against the family so that there was a larger picture." 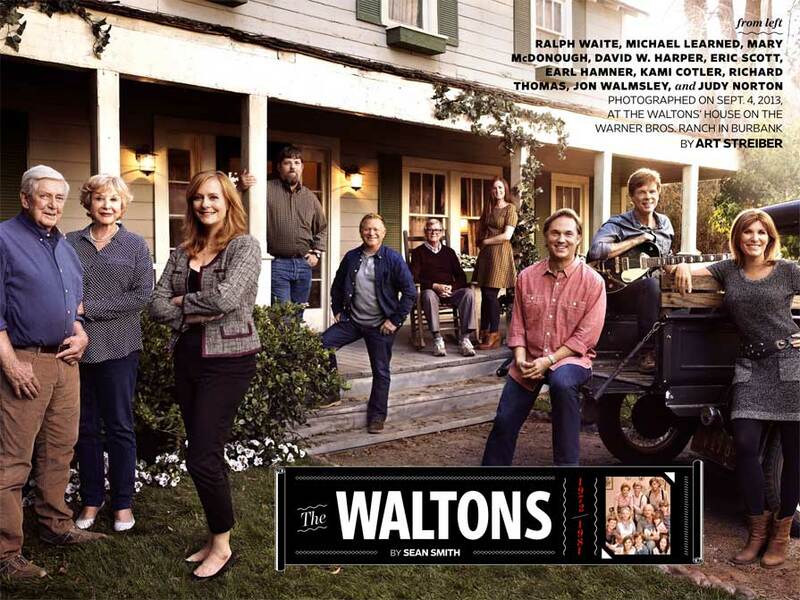 Whatever the issue, the Walton parents operated by a humanist moral code: Everyone, no matter how different, from you, deserves your kindness, hospitality, and respect. Series creator Hamner, 90, insists that they weren't trying to teach anyone a lesson. "It puzzled me at first when people would write and say, We're so grateful for that message you sent last night,'" says Hamner, who also provided the voice-over narration that began and ended each episode, "I kept thinking 'What message?' I'd go back over the scripts, and it occurred to me; Because we were dealing with people of principle, we were sending a message unwittingly." 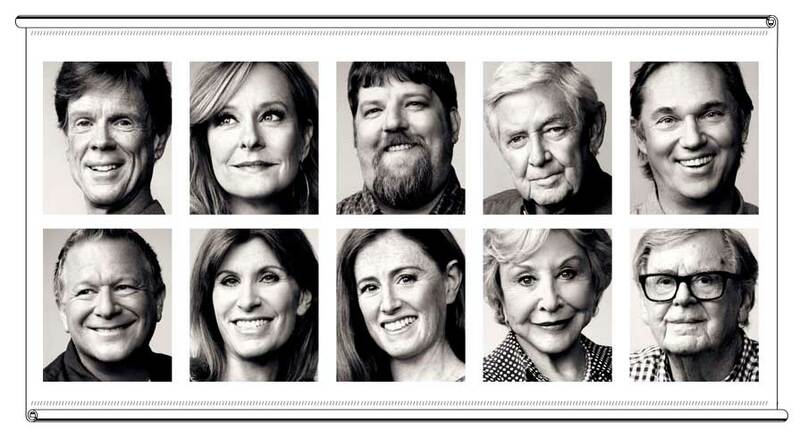 If you grew up watching The Waltons, as most Gen-Xers did, none of that registered of course. As half of us became latchkey kids and stepchildren, what we remember most is the security of knowing at least one family that stayed together. "What has moved me the most is the mail I'm still getting," says Waite. "They tell me that I was their surrogate father, the one who brought them up." That family came back together recently on a scorching September day at the Warner Bros. Ranch in Burbank. The original exterior set of the Walton's house burned down years ago, but the home was rebuilt in a new location for reunion specials. The castmates have all stayed in touch over the years, so the conversations were casual and full of laughter. "It truly is a family," says Judy Norton, who played eldest daughter Mary Ellen. "I can get mad at them and know that we still love each other." Waite and Learned sat in the shade and chatted, and Waite confirmed a story that he had, years earlier, stopped to buy a pack of cigarettes on the way home from having surgery. (He has since quit.) Missing were grandparents Geer, who died in 1978, and Corby, who died in 1999. "You know, this may be the last time we're all together," says David W. Harper, who played youngest son Jim-Bob. "This is a chance for us to come full circle." 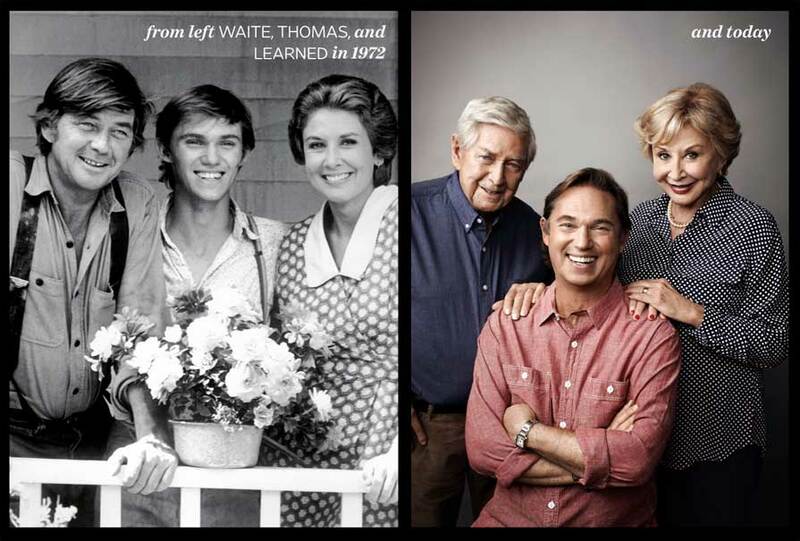 It's hard to imagine a traditional family drama succeeding today, when it feels like all of television is, as Thomas puts it, about"f---ing and killing" Perhaps the most subversive thing about The Waltons was that it refused to yield to conventional wisdom. "I think the audience needed this affirmation of values, and we supplied that," Hamner says "It lifted their spirits. And the country needed lifting."